The Leitrim Road is one of the worst and most dangerous roads in the area says Sinn Féin Cllr John Rice. Local resident Liam Rice talks to Cllr John Rice about the dangers of the Leitrim Road. 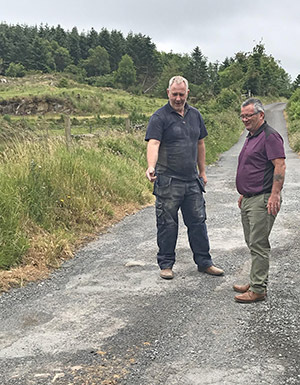 Cllr John Rice has urged the Department of Infrastructure to repair and resurface a stretch of the Leitrim Road, outside the village of Leitrim. The Slieve Croob councillor said: “This stretch of the road leads up to Castlewellan forest park and has a number of houses on it, however, it has become very clear that this very narrow country road has become unfit for purpose. The road is in a deteriorating and dangerous condition and it is unacceptable for local residents to be damaging their vehicles by using such a poor quality road. Oil marks and scrapes line the route clearly showing how damaging it is to vehicles. “I have therefore requested that this road is included in the Rural Roads Recovery Scheme which was first rolled out by our local MP Chris Hazzard when he was the minister for infrastructure which primarily focuses on the improvement of rural roads.